Despite my Monday mishaps, yesterday was a pretty good day. I wrote some new poems; sent off a couple submissions; and Alberto Rios, AZ’s poet laureate, accepted my friend request on Facebook. As you know, my poem is this week’s winner at high calibre poetry. Well I sent them a poem on happiness. I put Happiness – Nonet where you are suppose to enter your name. Oops, sorry guys. I should know better I’ve been entering most of the weekly challenges from the start of the year. 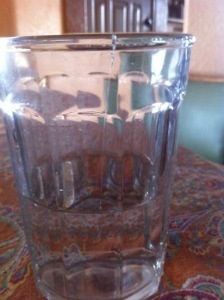 Then I went and got a glass of water. I thought there was a speck on the glass and was picking at it with my fingernail. Since it didn’t seem to want to come off, I looked more closely. There was a crack going down the side. I wasn’t going to let an opportunity slip by. I snapped a photo and wrote a poem. Don’t worry after the poem was written the glass found its way to the trash. #truestory just before 5PM yesterday there is a knock on my door. Sorry, Ma’am, I had to shut off your cable. I can schedule a repairman first thing tomorrow morning. For about 45 minutes before this my little one is complaining Netflix and youtube are not working. 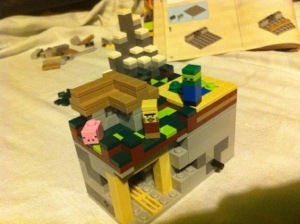 I was a good Mommy that day, giving her the minecraft village Lego set that came in the mail. Mostly because Dad spilled the beans of its purchase. But her complaint, I can’t construct Legos in total quiet! Hey, what do you know you have an MP3 player. It isn’t the same, Mom! Well just before 10AM this morning the leak was repaired. Not that my little one was happy. First thing in the morning was interpreted as – Before she left for school. I found this on my pillow this morning. Then I found out my Valentine cheated me. Both girls were given bigger stuffed animals. 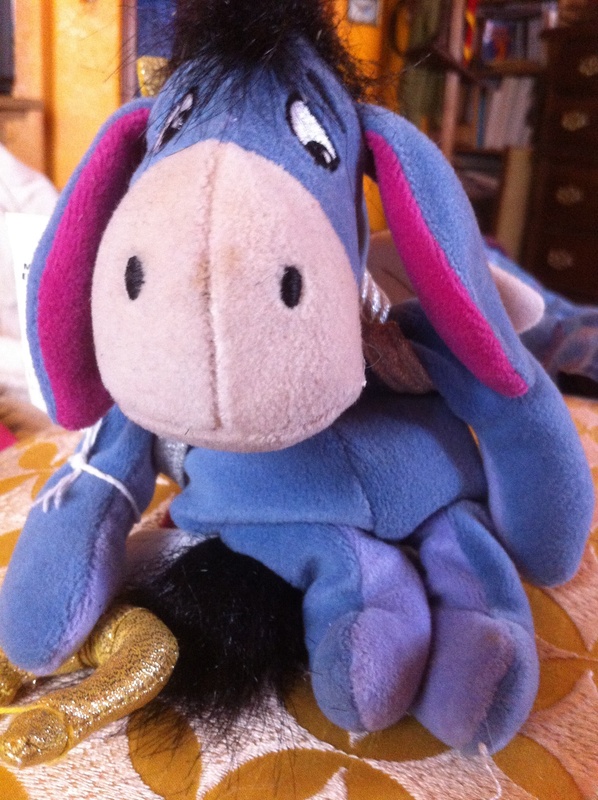 But my husband knows how much I love Eeyore and said, How often do you find an Eeyore dressed as Cupid. Poetry Nook volume 4 is now available from Plum White Press. 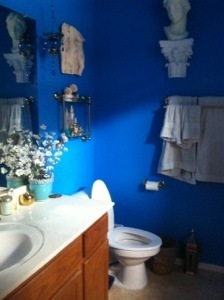 Over the weekend my husband remodeled the girls bathroom. We had one of those flat, sheet mirrors over the sink. We learned something new; took the brackets off the top and expected it to pull easily off the wall. Nope, wasn’t budging. Youtube has videos on everything. And we learned we were going to need suction cups to remove mirror. 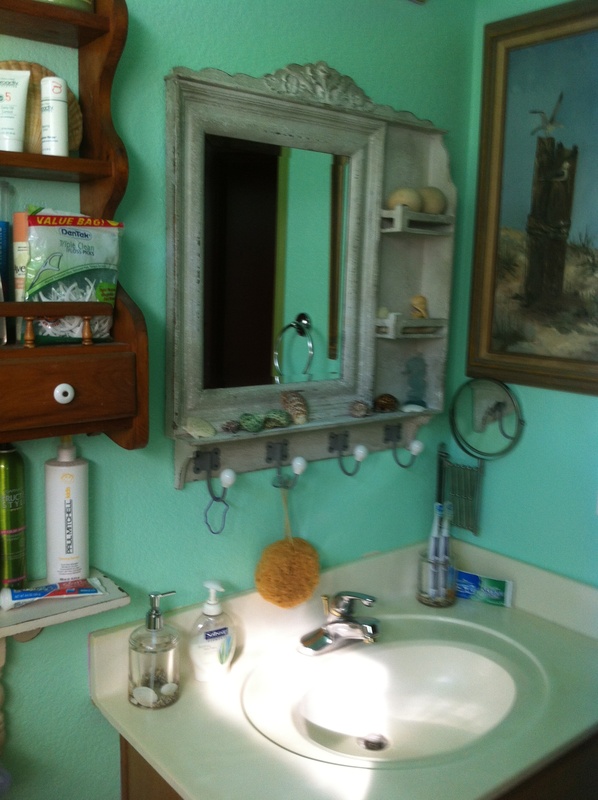 Once we had the right equipment, my hubby pulled the mirror off without a hitch. Because the how-to video recommended safety googles and long sleeves (off chance the mirror cracks while pulling it down) my hubby also put on his work boots. This morning about five minutes after he left for work, I hear someone come in the front door. He had to retrieve his work boots from the garage. Always smart to have your steel toe boots when using lathes and mills at work. I’m a mean awful Mom. My oldest daughter wanted me to write a poem for a friend’s youtube video. To set up this post, I deleted my daughter’s bloons city game. Well her friend thinks if I share the youtube link for the video, she’ll get more views. I don’t think my daughter knew what sacrifice she would have to make for her Mom’s poetry. Tweetspeak has a Spanish lace playlist accompanying their poetry prompt. Today’s word for #haikuchallenge was delicate. Every morning I check the Little One’s backpack to make sure she has everything for school. As she heads out the door, she always says, “I feel like I’m forgetting something,” and I reassure her she hasn’t. This morning I noticed two books, one she just finished reading. I shook my head and admonished her older sister. See what happens when you become a book dealer? Your younger sister turns into one too. Sure enough when I ask the Little One why she has two books, she told me her friend wants to read the one she just finished. Then I heard yesterday another friend took the book she is currently reading and started to read it, asking her where she got it. Mom, who happens to be a book dealer herself, knows where to get the good stuff. The Little One is currently on her second Doctor Who media tie-in novel. I know how to give my little fan her Doctor Who fix. I can’t believe she has friends who think media tie-in books are cool.